I'm blogging today about an amazing event I went to last week! Those lovely people at The Bridges, Sunderland invited some of us North East bloggers along for a taste of their late night Christmas shopping experience-and it was really good fun. Being a Sunderland girl, I love events at The Bridges; when I was growing up, my Mam and I often went there for late night shopping on a Thursday evening on the run up to Christmas and visiting this time of year always puts me in the festive spirit! I love Christmas so much! I decided to use the evening as an excuse to debut one of my latest purchases from Archive By Alexa. I absolutely love the oriental winter floral print, and teamed with my leather skirt and pussybow tie; I was ready to hit the shops! On arrival we were greeted by the lovely Sam, who gave us our amazing goodie bag and our plan for the evening. Each goodie bag contained a £10 Bridges gift card to encourage us to spend away which was a really nice touch-along with some nibbles to keep us fuelled for our shopping fest. We were split into groups of four, and each given a timetable of the evening ahead. I was with Cat, Tor and Alice who were all really lovely (it's always great to meet bloggers face to face!) and our first stop was Lush for bath bomb making and Christmas gift fun! I loooooove Lush! Especially at Christmas time. The smell-AMAZING!! I was super excited to learn how to make a bath bomb and couldn't wait to get my hands in the mixture!! We were making a Butter Bear and were each given a bear mould to press our mixture into. The smell was sensational-I love cocoa butter and Butter Bear is one of my personal Christmas favourites (super softening on the skin!). I would've been heading straight home and putting my bear in the bath, but we were under strict instructions to leave the bear to set for twenty-four hours-but lucky for us we were given another goodie bag filled to the brim with Lush stuff to use straight away! Thank you lovely people of Lush! It was also great to have a good look at what Lush's Christmas range has to offer, particularly as I tend to buy loads of presents from there. There's loads of stuff to suit every price range, and we got to see demos of some of the products too. I particularly loved the Magic of Christmas wand; a bubble bar that smells like Christmas in a bath (or a jug in this case!). I'll definitely be back to buy one of these for Christmas Eve! The next stop on our trip was Debenhams to visit Clarins, Estee Lauder and Benefit for some help with our skincare routines. 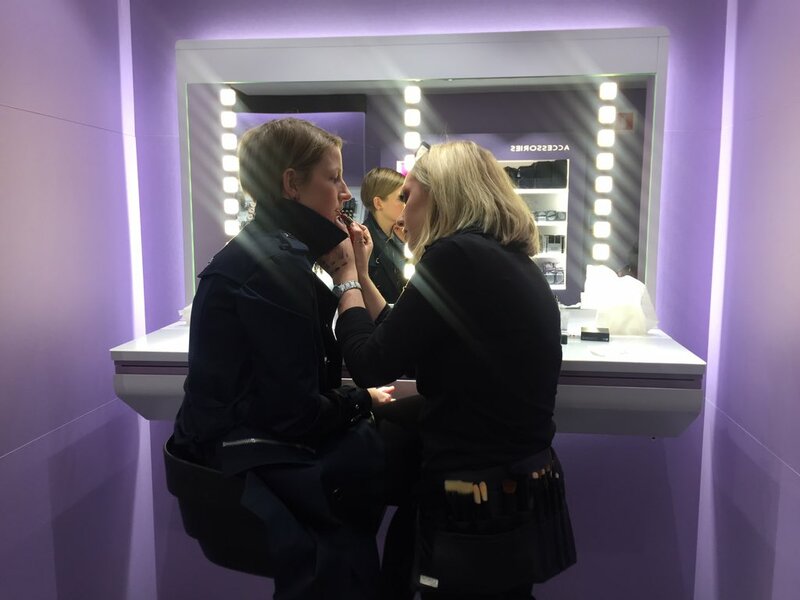 As we only had a twenty minute time slot in each store, for this one I bowed out and listened whilst Laura at Estee Lauder gave Cat a thorough skin analysis and tips to help improve her routine. Cat left loaded with information and with loads of amazing goodies from Laura, who was absolutely excellent-I'd really recommend having a skin consultation with her. She was thoughtful and informative and gave some really good tips on the best products for her skin, giving her lots of options to go away and think about. I'll be honest-I don't have a skincare routine-I'm a soap and water, cleansing water and moisturise when I remember girl, so I didn't think I'd really be the best person to put myself forward for an analysis. However, I'd definitely visit Estee Lauder if I needed help-Laura was lovely! Running a little bit late, our next stop was newly opened Kiko, for makeup demos. 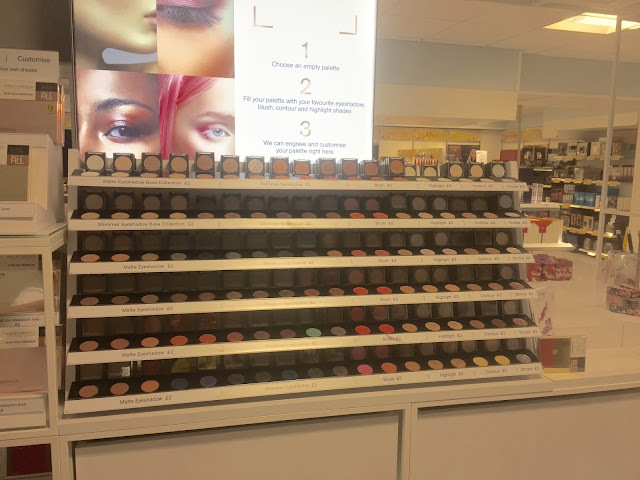 I recently visited Kiko when it first opened a fortnight ago and I have to say the staff are lovely and the makeup is purse friendly, what more could you want?! I've been shopping at Kiko for a while in their stores in London and Newcastle; I love their creamy long-lasting eyeshadow crayons, they're ace! Cat listened this time, whilst I chatted to the lovely MUA about choosing a long-lasting red lipstick. She asked me a few questions about the style of lipstick I preferred and gave me lots of colour options to choose from, along with the best price combinations should I want to include a lip-liner. She then took me to the demo area and applied some for me and I loved it! 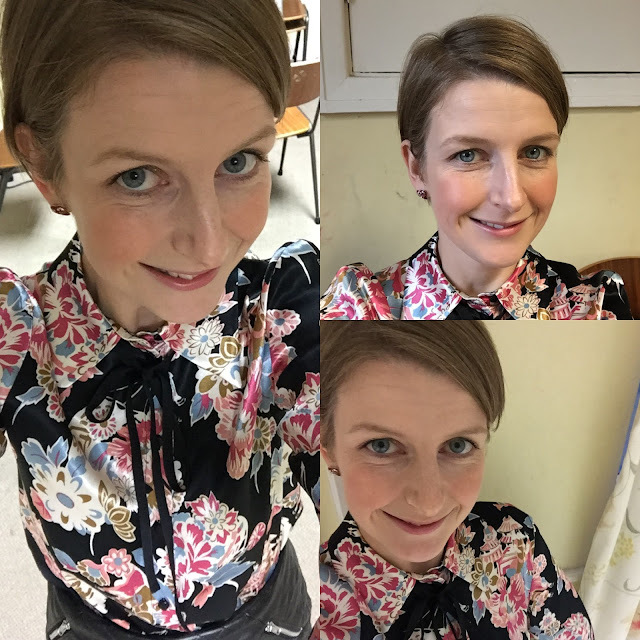 I went for Gossamer Emotion Creamy Lipstick 113 (I'm not a great lover of Matte) which was total bargain at £10.90; I've worn it loads already and it lasts all day-exactly what I wanted!! Next on the list was The Bodyshop, who kindly gave us free reign to choose some free samples of any of the products we'd like to try. We also got another goodie bag with a few little samples and a full browse of their amazing Christmas range. I loved these little monkeys above, particularly Reggie Jnr, a donation from each Reggie purchase (along with many other products in store) goes towards restoring an area of the rainforest that has been damaged, to help endangered species to reconnect. To find out more about the Bodyshop's amazing Bio-Bridges campaign check the link here and help little Reggie find love! I'll definitely be back to pick up a Reggie-its great to see Christmas pennies going towards such a great cause! Our final stop of the night was visit to Boots for a tour of their all new Emporium and for a No7 colour match. As we were so late getting to this one, there was only time for the tour-but I loved it. We were shown around the new Christmas gifts section, and with the addition to the Emporium of a machine that can personalise pretty much anything-the possibility of gift combinations is endless. From build-able makeup palettes that can be engraved with a cute personal message, to body lotions where you can upload a photo of the person receiving the gift-I absolutely loved the new range. We were each given a personalised makeup brush to take home, here's mine being engraved! I left Boots with so many ideas for gifts, that I can't wait to start shopping for my presents-bring on payday! I had a really good time at the Bridges and left laden with goods and ideas for presents. The Bridges is open until 8pm every Thursday (you can even park free from 530pm-9pm). Their festive hours begin on December 12th, where they'll be open until 8pm Monday-Friday, 9-530pm on Saturdays and 11-5 on Sundays. Thanks so much for inviting me along to the event! Wow what a brilliant event! I love the new Emporium in Boots, I've made both my sisters makeup palettes for Christmas and it was so much fun! I'm looking for Christmas ideas in Sunderland at present and just found your post. Nice work.